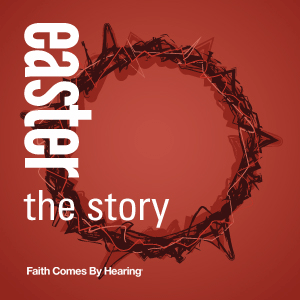 This awe-inspiring revelation comes from Easter: The Story – a free, 9-minute dramatized audio production taken word-for-word from the New Testament book of Mark (chapters 15 & 16). The lifelike recording was made using multiple character voices, music, and sound effects to maximize the excitement and emotion of the Scriptures. We hope you’ll take advantage of this chance to engage with and share this meaningful Bible passage and make it a part of your yearly Easter traditions! After listening, you can download the file by right-clicking the play icon above and selecting “Save audio as…”. Feel free to broadcast, make copies for others, and share this program through social media, but please do not charge for those copies or alter the content in any way without permission.